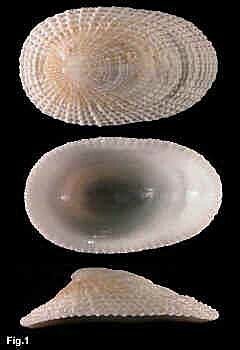 Description: Shell oval, widest posteriorly. Apex at posterior third, backwards pointing. Anterior slope convex, posterior slope concave. 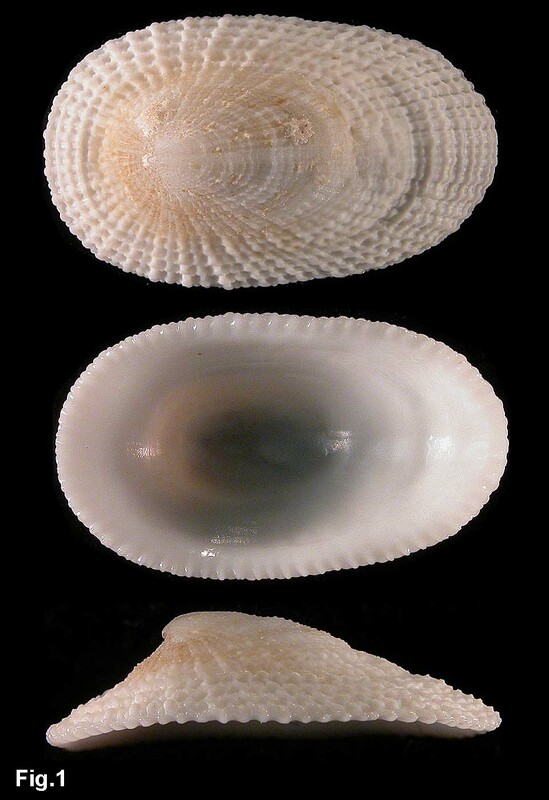 No slit anteriorly; anterior margin of shell with broad, shallow elevation. Selenizone restricted to a rib on first few millimeters of apex. Sculptured with 60-80 radial ribs and irregular concentric growth ridges. Margin crenulate within. Colour white or fawn. Size: Up to 43 mm in length, typically about 20 mm. Distribution: In Australia, from Caloundra, Queensland, to Victoria, but see remarks below. Habitat: Under rocks and in crevices on exposed rocky shores, from low tide down to at least 25 m. Common. Remarks: A similar species, Tugalia cicatricosa A. Adams, 1852 (Synonym Tugalia tasmanica Tenison-Woods, 1877) occurs from Victoria to south-western WA and Tasmania. It is described as being more depressed with coarser sculpture; some specimens have a groove internally and the selenizone is a raised rib from apex to margin. There is continuous variation of characters from T. parmophoidea to T. cicatricosa, so the two are probably the same species.